College-aged women are extremely prone to a form of sexual harassment known as “street harassment.” Stop Street Harassment defines street harassment as “catcalls, sexually explicit comments, sexist remarks, groping, leering, stalking, public masturbation, and assault.” Street harassment makes women feel unsafe and uncomfortable in environments where they should feel secure. Many men who harass women on the street do so only when a woman is alone or with other women. Rarely will a man use this form of harassment against a woman while she is with another man, which is a clear signal that these harassers know what they are doing is wrong. Stop Street Harassment says that 80 percent of women worldwide will face street harassment... and that statistic is not okay. Here are several helpful suggestions to keep in mind. Most of the time women do not know who the harasser is. If you are harassed, take a mental note of the harasser’s physical appearance and where you were when the incident occurred. Having a cell phone picture is also helpful if you take the incident to the police. If your harasser is in a car, take down the license plate number and report it to the police. By taking down the number, your harasser will know you are serious about not wanting to be bothered. If you do not feel directly in danger, tell the harasser that you do not appreciate his actions towards you. Do so in a calm and assertive manner. If you see someone being harassed, step in and help them. Men in particular should do this if they see a woman being harassed. Download the Hollaback app on your smartphone -- it is a quick and easy way to help you report street harassers. Remember that everyone has the right to feel safe and comfortable. Street harassment is a gender-based crime that is too often culturally accepted. It is important that young women realize that it is unacceptable, but it is only through your actions that it can be stopped. 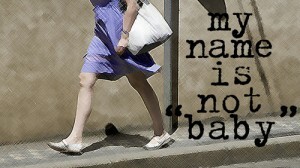 For useful resources about stopping street harassment and getting help, visit stopstreetharassment.org. WOW! What a wonderful article! CG should have more content like this! I am so proud that this is here! I totally agree with the individual who commented above!! !